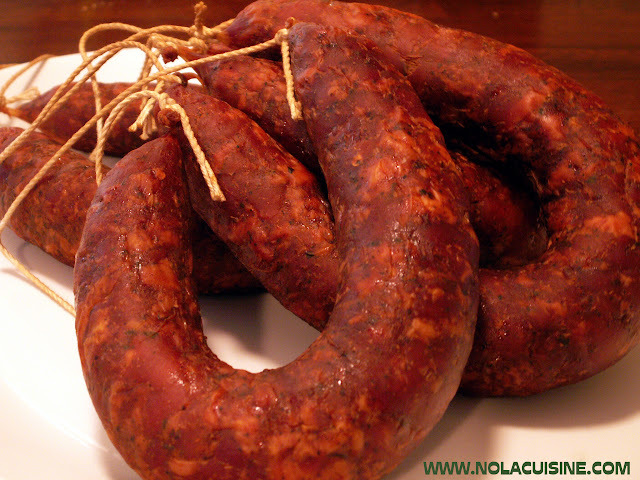 I’ve gotten flack from a few bloggers about my use, or rather misuse of “Cure #1” in my Andouille Sausage Recipe. If this recipe has failed you or has worked out well for you, please just let me know either way!!!!. Sincerely, Danno. I’ve lost count of the number of times I’ve made andouille using your recipe, and it’s always excellent – last batch was 13#! My wife and I were in NOLA for the BCS championship (sad), and managed to come home with both Cochon Butcher’s and Jacob’s. I’m happy to report that your recipe beats both, easily. I don’t know of any higher praise I can bestow. Thanks! I have made your recipe several times to nothing but rave reviews. I’m from KC and you simply cannot get Andouille here. Thanks for all of the recipes. Nothing wrong with this recipe, it produces a nice product. I have never had a “Bad” recipe from your site and at time spend hours reading here.